Azra microphylla has flowers that smell like white chocolate! This small evergreen tree comes from South America. It has broad leaves and is sensitive to cold. 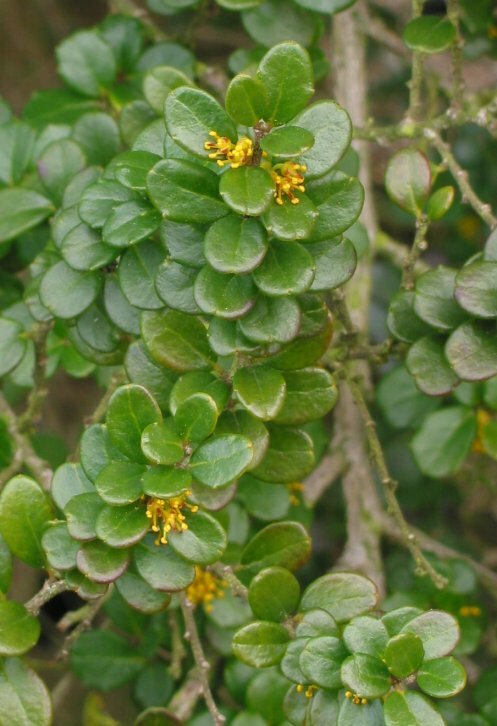 It is a large shrub or small tree of upright growth and notably fine-textured dainty foliage. In Seattle, England, and Ireland specimens have been measured 40 feet tall or more. Its elfin leaves measure only a quarter inch to an inch long; they are dark green and shiny. Minute, almost unseen flowers are yellowish-green, intensely vanilla- or chocolate-scented in late winter or early spring –anytime from December into April. For their fragrance alone this is a superb tree to grow. The fruit is a tiny one-seeded berry a quarter inch long, first reddish-orange, ripening in June or July to the color of chocolate milk, yet shiny and speckled; slightly bitter vanilla-flavored. Its cultivar ‘Variegata’ has leaves variegated with creamy white so it lights up dark garden corners wonderfully. It was introduced to cultivation around 1916; possibly it was raised by Slieve Donard nursery of Ireland. Once very rare, it has been cultivated in the United States since at least 1966. The tallest I know is 25 feet, planted in Seattle in the 1990s. Azara microphylla (chinchin) is an early spring flowering evergreen shrub or small tree native to southern South America (Chile and Argentina). Its golden flowers are small, abundant and smell strongly of vanilla or chocolate. Azaras tiny, tiny leaves, are arranged in opposite “leaf” pairs are composed of larger true leaves and smaller, leaf-like stipules – a genuine botanical oddity. Here’s a video staring our lovable funny animal pets. Enjoy! Africa rats are trained detectives. They use their sensitive noses to sniff out land mines and for diagnosing tuberculosis (TB). 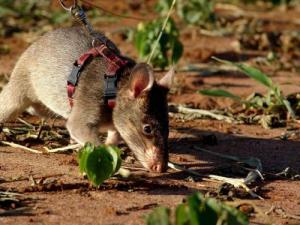 The rats sniff out land mines in Mozambique. They are bred to be the size of raccoons! Considered ridiculous at first, these squads of mine-sniffing rats have made belivers out of the worst skeptics. Now officials are considering using them in the Democratic Republic of Congo, Zambia and other countries where unexploded mines remain common. Trained TB sniffing rats are “employed” in Tanzania, to identify spit samples at four medical clinics. The rats have found more than 300 cases of TB that hadn’t been diagnosed by medical staff. Now Bart Weetjens of Belgium uses his trained rats to scratch when they smell the vapor from land mines or the smell of disease. When they scratch, their handlers signal them with a clicker and then reward the animals with a piece of fruit or a nut. Weetjens was asked why the rats don’t simply scratch to get food. The best cat is a cleaning cat? But this kitty decided to hop on a Roomba, the robotic vacuum cleaner made by Massachusetts company iRobot. The video has become an Internet sensation and also appeared on the CNN Headline News show ‘News to Me.’ CNN said Tuesday that more than 1.6 million people have watched the cleaning kitty on YouTube. Check out the video below to see the cat take a wild ride. Zebra mussels, such as these, have been found in Utah’s Electric Lake, the state’s first body of water invaded by the fast-spreading and damaging creatures, officials said Nov. 20. What is black and white and red down its back with a long blue tongue? The mythical Okapis have reddish dark backs, with striking horizontal black stripes on the front and back legs, making them resemble zebras from a distance. These markings are thought to help young follow their mothers through the dense rain forest; they also serve as camouflage. The tongue of an okapi is long enough for the animal to wash its eyelids and clean its ears (inside and out): it is the only mammal that can lick its own ears. Male okapis have short, skin-covered horns called “ossicones”. They have large ears, which help them detect their predator, the leopard. Okapis are 1.9 to 2.5 m (8.1 ft) long and stand 1.5 to 2.0 m (6.5 ft) high at the shoulder. 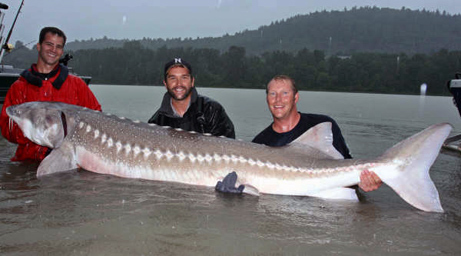 They have a 30 to 42 cm (12 to 17 in) long tail. Their weight ranges from 200 to 270 kg (465 to 565 lb). Usually solitary Okapis come together only to breed. Okapis forage along fixed, well-trodden paths through the forest. They live alone or in mother-offspring pairs. They have overlapping home ranges of several square kilometers and typically occur at densities of about 0.6 animals per square kilometer. The home turf the of males is larger than the females, but the males will allow the femals to eat on their home turf. Okapis do not get together in groups so with land dwindling around their home range they seem to have adjusted and tolerate each other in the wild and may even feed in small groups for short periods of time. Okapis prefer altitudes of 500 to 1,000 m, but may venture above 1,000 m in the eastern montane rainforests. The range of the okapi is limited by high montain forests to the east, swamp forests below 500 m to the west, savannas of the Sahel/Sudan to the north, and open woodlands to the south. 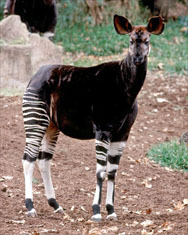 Okapis are most common in the Wamba and Epulu areas in the heartland of Africa. Okapis like to eat tree leaves and buds, grass, ferns, fruit, and fungi many of these plant species are poisonous to humans. When okapi feces were analyzed scientists were surprised to see even charcoal from trees burnt by lightning were consumed as well. Field observations indicate that the okapi’s mineral and salt requirements are filled primarily by a sulfurous, slightly salty, reddish clay found near rivers and streams. Although okapis are threatened by habitat destruction, poaching and wars. The Congo Civil War threatened both the wildlife and the conservation workers in the reserve. There is an important captive breeding centre at Epulu, at the heart of the reserve, which is managed jointly by the Congolese Institute for Nature Conservation (ICCN) and Gillman International Conservation (GIC), which in turn receives support from other organisations including UNESCO, the Frankfurt Zoological Society and WildlifeDirect as well as from zoos around the world. The Wildlife Conservation Society is also active in the Okapi Wildlife Reserve. On June 8, 2006, scientists reported that evidence of surviving okapis in Congo’s Virunga National Park had been discovered. This had been the first official sighting since 1959, after nearly half a century. In September 2008, the Wildlife Conservation Society reported that one of their camera traps snapped a photo of an okapi in Virunga National Park; this was the first time the Okapi had ever been photographed in the wild. 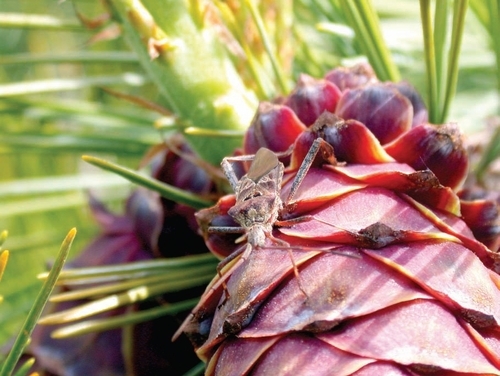 Scientists discovered that the White pine cone beetle dines on pine cone seeds, It uses a special ability to find its next meal. It senses the pine cones temperature. As part of being alive, all living things give off heat and infrared light energy. While this wave length of light cannot be seen by humans, scientists have found that the white pine cone seed-eating beetle is able to detect infrared energy. Image one (at the right) shows two pine cones, the large one is healthy and normal size, but look at the smaller one. That one has become dinner for this beetle. Scientists decided to find out how they found the cone amongst the needles and why the beetle chose one cone over the other to eat. They observed the beetles in the wild on the trees and in the lab and measured the heat given off by the needles and the cones to see if there were any differences in temperature. The researchers decided to use a special camera that can make infrared light visible. On the camera screen, heat given off by living things showed up in shades of yellow and orange. It can make infrared light, this heat visible. 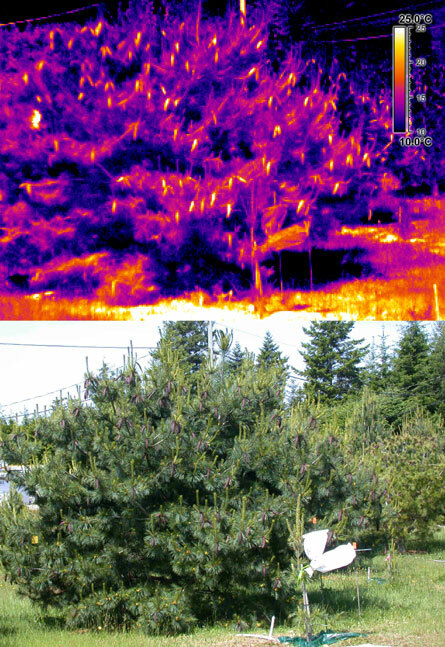 When the scientists looked at the western white pine tree with this thermographic camera, the beetles’ food, the pine cones lit up like holiday lights. The trees looked as if they were covered in candles. The camera’s lens showed that the pine cones actually are hotter than the needles. 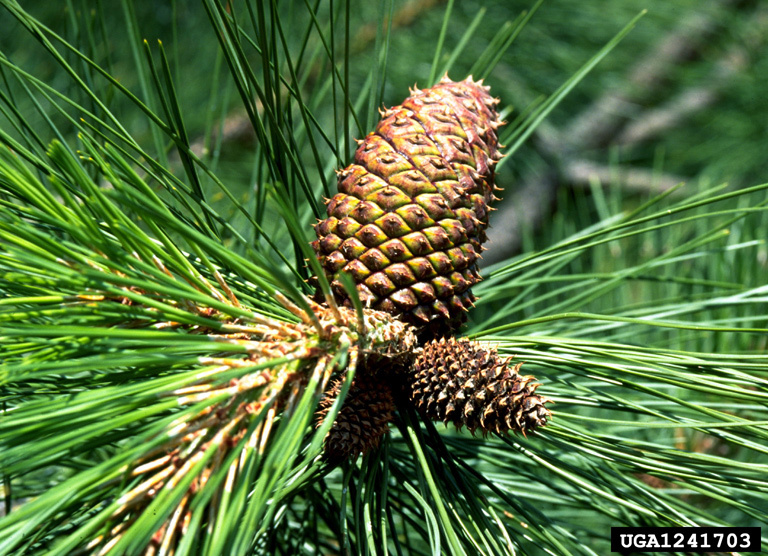 The cones run 15 degrees Celsius warmer than the surrounding needles all year around. So was this insect prefering a hot meal? How did the beetles sense this heat difference from the needles to cones? Back in the lab the scientists wanted to find out how these beetles sense heat. The scientists tested this theory by painting over the external body sensors with silica paint. This kind of paint blocked the pine beetles’ sensors from detecting the heat. The painted beetles no longer could find the heated cones. On the beetle’s’ body, researchers found sensors that seemed to be used to find the warm cones. Inside the insects’ nervous system, which responds to input from the senses. The researchers found a clear pathway from the sensors to the brain. This connection might be used to tell the beetle’s brain that hot food is directly ahead or, maybe, a little to the right. Why do scientists care how this beetle finds its food? This beetle is eating young pine cone seed so they cannot become trees. Inside the pine seed when the beetle finishes eating it looks like wet sawdust. 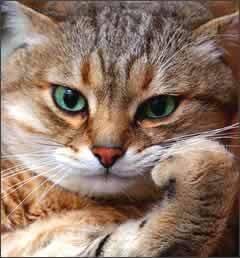 It is quite troublesome. The Western White Pine (Pinus monticola) on which the beetles dine is endangered. It occurs almost exclusively in the Northern Rockies Eco-region. Until about 50 years ago, it was the most abundant forest type in that region. Replacement fires occurred at a given location every 150 to 250 years on the average. Mixed severity fires that killed only part of the stand occurred at about 60 to 85 year intervals. Today, the number of western white pine is 93 percent less than 40 years ago. So cute give me a hug – Ouch ! Help!! In Beling a critically endangered panda at a zoo in southern China did not want a hug from a student who jumped a fenced in enclosure with warning signs to get one. The 20-year-old male student surnamed Liu scareda very startled panda, named Yangyang. So the animal defended himself by biting the intruder, The panda repeatedly bit at Liu’s arms and legs,” Zookeepers rescued the man and calmed the panda. Scientists believe fewer than 2,000 giant pandas live in the wild in China. Wild pandas live only in remote, mountainous regions in central China. These high bamboo forests are cool and wet—just as pandas like it. They may climb as high as 13,000 feet (3,962 meters) to feed on higher slopes in the summer season. The giant panda bear only exists today in six small areas located in inland China. The habitat, suitable for the bamboo on which it survives, is a cold, damp coniferous forest. The elevation ranges from 4,000 to 11,000 feet high. In most of the areas in which they still roam wild, they must compete with farmers who farm the river valleys and the lower slopes of the mountains. The giant panda has an insatiable appetite for bamboo. A typical animal eats half the day—a full 12 out of every 24 hours—and relieves itself dozens of times a day. It takes 28 pounds (12.5 kilograms) of bamboo to satisfy a giant panda’s daily dietary needs, and it hungrily plucks the stalks with elongated wrist bones that function rather like thumbs. Panda Bears eat over fifteen different kinds of Bamboo. Because of a inefficient intestinal system the Panda must feed for 12 to 16 hours a day, they can consume 23 to 86 pounds of Bamboo each day, sometimes eat birds or rodents as well. The head of a Panda is very large and has developed special molars for chewing plants. It has powerful muscles which extend from the top of it’s head to the jaws giving it the ability to crush very tough stalks. There esophagus has a though lining to protect the Panda from bamboo splinters. The stomach is protected too, with a thick muscular lining. Giant pandas are solitary. They have a highly developed sense of smell that males use to avoid each other and to find females for mating in the spring. After a five-month pregnancy, females give birth to a cub or two, though they cannot care for both twins. The blind infants weigh only 5 ounces (142 grams) at birth and cannot crawl until they reach three months of age. They are born white, and develop their much loved coloring later. A sedentary bear generally move in a slow, determined manner. When startled, they will move at a slow trot to escape danger. Giant pandas, with their short claws, are capable of climbing trees very easily. 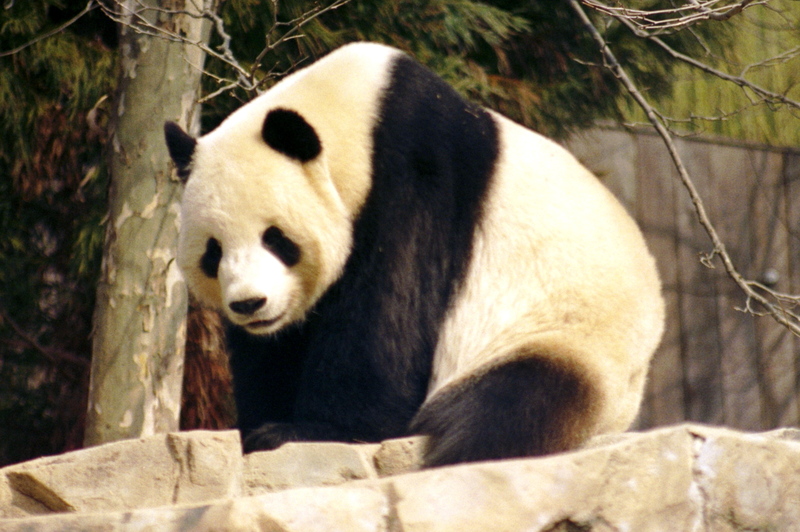 Adult Giant pandas are about 5 feet long from nose to rump, with a 4-6 inch tail. A large adult panda can weigh about 220-330 pounds, with males 10 percent larger and 20 percent heavier than females male is about the same size as the American black bear. Much of what we know about pandas comes from study of these zoo animals, because their wild cousins are so rare and elusive. 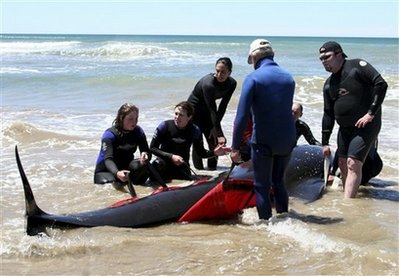 Their numbers are deceasing due to dwindling habitat and their poor reproductive capabilities, both in the wild and in captivity. Today, only around 61 percent of the population, or about 980 pandas, are under protection in reserves. As China’s economy continues its rapid development, it is more important than ever to ensure the giant panda’s survival. The survival of the panda and the protection of its habitat will ensure that people living in the region continue to reap ecosystem benefits for many generations. At the Creative Artists Agency in Los Angeles Wednesday, film directors and screenwriters were inspired and entertained while listening to some of the top scientists in engineers in the country talk about their research. Hollywood directors, producers and writers had a chance to learn about some of the hottest science and engineering topics from the top experts from several fields of research… Rare and infectious diseases were described by Bonnie Bassler, a molecular biologist at Princeton University who has spent her career studying bacteria that glows in the dark. Artificial intelligence and cutting-edge robotics was explored by Rodney Brooks, a roboticist and chief technical officer of Heartland Robotics, while some of the mysteries of the brain were revealed by neurologist V.S. Ramachandran, director of the center for Brain and Cognition at the University of California, San Diego.